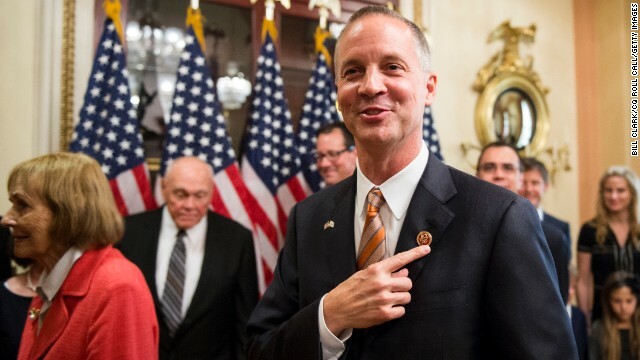 (CNN) - Rep. Curt Clawson, a congressman for all of one month, made an embarrassing mistake this week when he confused two Obama administration officials with representatives from India. At a Thursday hearing of the House Foreign Affairs subcommittee on Asia and the Pacific, Clawson talked how much he admired the witnesses' country. "I love your country, and I understand the complications of so many languages, and so many cultures and so many histories all rolled up into one," the Florida Republican said. Video of the exchange can be seen on the committee's website, at about 1 hour and 36 minutes, and again at 2 hours and 17 minutes. Foreign Policy was the first to report the story. "I made a mistake in speaking before being fully briefed and I apologize. I'm a quick study but in this case I shot an air ball," Clawson said in a statement released Friday. It was clear Clawson didn't realize he was speaking to Nisha Biswal and Arun Kumar, two high-level officials at the State Department and Commerce Department, respectively. "Just as your capital is welcome here to produce good-paying jobs in the U.S., I'd like our capital to be welcome there," he said at a later point in the hearing. "I ask cooperation and commitment and priority from your government in so doing. Can I have that?" As Kumar sat with a big grin, Biswal politely responded: "I, I, I think your question is to the Indian government, and we certainly share your sentiments and we certainly will advocate that on behalf of the U.S. government." "OK," Clawson said, smiling. "Let's see some progress." Late Friday night, Biswal tweeted about the incident, calling it an "honest mistake" on the part of Clawson. "Honest mistake by new Member of Congress -but the strength & beauty of America is its diversity. Proud to represent my country & Prez Obama," she wrote. He was elected last month to fill the seat vacated by Republican Trey Radel, who stepped down earlier this year after getting caught buying cocaine from a federal law enforcement agent. A former CEO of a global manufacturing company, Clawson joined the Foreign Affairs Committee a couple of weeks ago. Chairman Ed Royce, R-California, pointed to Clawson's "fluency in four languages and his time residing in six countries" as some of Clawson's top-shelf credentials in a press release announcing his new position. CNN's Deirdre Walsh contributed to this report. America, after the late 1800s, was never a WHITE AMERICA. Remember when the US took over AZ, CA, NM the population was Europen Spanish, Mexican and some French/Mexican. But considering that US history starts with Plymouth Rock, we are essentially British as is our laws, religions, and ethnic outlook (excluding the Irish and Italians which every one (i.e. British) hated. This guy is sure evidence that Repubs don't vote for intelligence. He hasn't noticed that the U.S. ain't been quite so white since the turn of the century.